Here's a little cocktail that I've been making since I can't even remember when. I've always liked V-8 juice more than plain tomato juice just because it's so much more flavorful. I guess my body craves vegetables from time to time because I seem to go on V-8 kicks every so often and I'll drink it like it's my job. It's just so satisfying and it always gives me a boost! Anyway, one day I poured myself a glass, just as a mid morning pick me up, and decided to add a bunch of things to it. I loved the way it turned out, and I've been drinking it this way ever since. Then one day I thought, "hmm, maybe I should write this down." It was only then that I realized that it's basically a Bloody Mary with my own little twist. (which is why I added vodka to the recipe). If you know me, you probably know that I rarely ever drink and that I'm not really one for "hot & spicy", so I always leave out the vodka and throttle back the spice. But if you want the kick and love the heat, have at it! Place all ingredients in a tall glass with ice. May be shaken vigorously or stirred lazily, as desired. 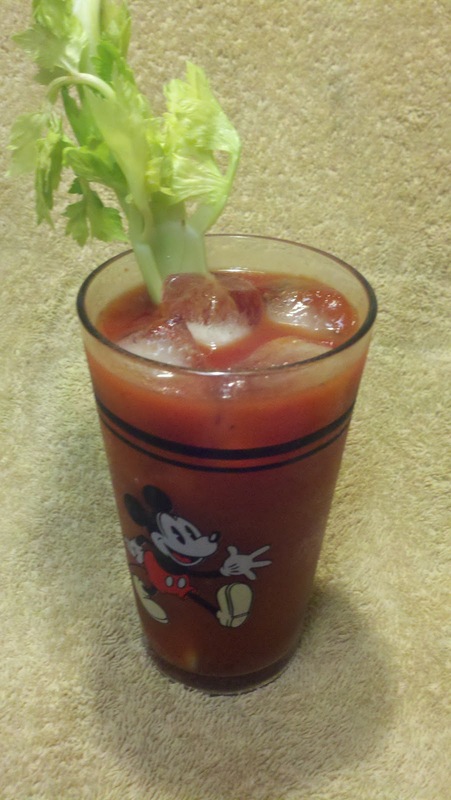 Garnish with a rib of celery. To make it extra spicy, use Spicy V-8 juice instead of the regular, and add as much Tabasco as you're brave enough to add. You can also add a diced jalapeno, or even a Habanero chili if you're a maniac. Clearly, all of the ingredients are added to taste. If you like a lot, add a lot!